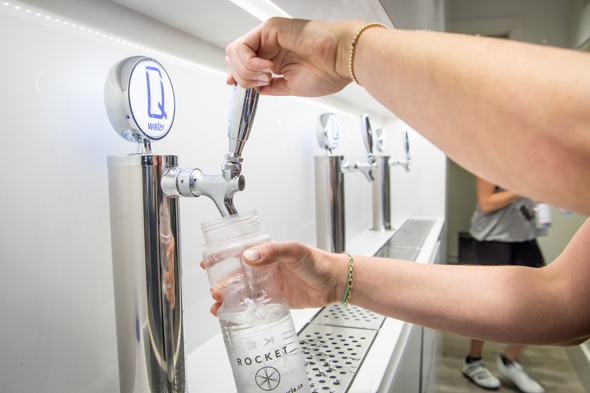 Rocket Cycle is the Cadillac of spinning studios - or maybe calling it the Porter Airlines of spinning studios is more accurate. The studio's space is elegant and immaculate, but without pretention. 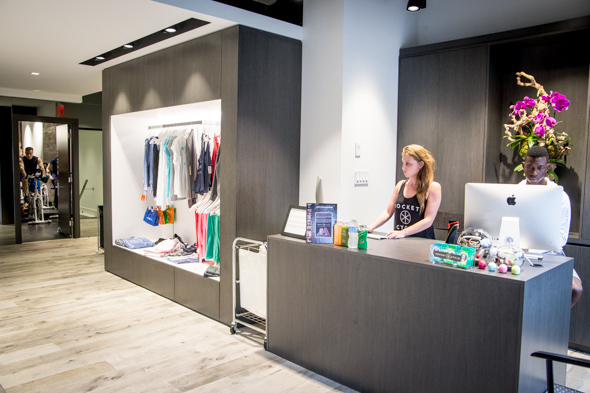 Everything about the studio has been designed to make it welcoming to all, creating as seamless a rider experience as possible. Partners Dana Rocket and Rory Pederzolli are on a mission to remove the intimidation factor from indoor cycling. You sign up for classes online and you can even chose your bike. In order to avoid bottlenecks at the front desk before classes, you can sign in using their wall-mounted iPads by punching in your cell phone number. Don't have cycling shoes? You can borrow theirs. 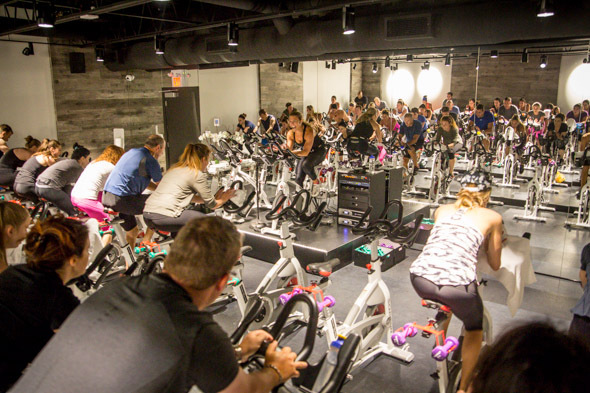 Grossed out by sweaty spinning bikes? They clean the whole studio between each class. 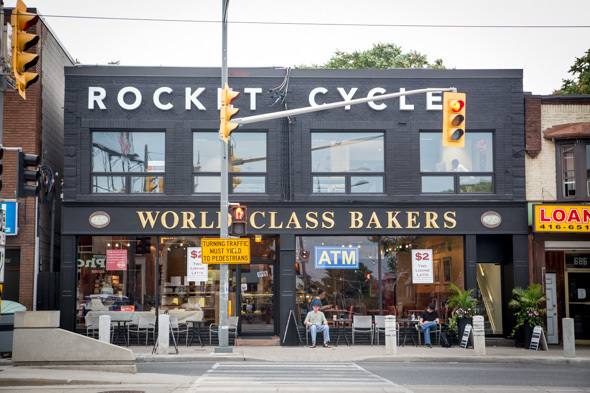 Located in my 'hood, on St. Clair at the top of Christie, right above neighbourhood landmark World Class Bakers , Rocket opened quietly this summer in a community not yet saturated with fitness facilities. I tried the Rookie Ride on a Thursday morning at 10:30am. Although I've been spinning a long time, the class fit into my unorthodox schedule. Who can attend a spin class at that time, besides self-employed folks like myself? Well, apparently, a lot of people! The 9:30am class just finishing when I arrived was packed, and a dozen of us filed in for the Rookie Ride. Lots of people are scared off of trying spinning because it is perceived to be only for elite level athletes and very fit folks, but nothing could be further from the truth. It is an activity well-suited for individuals of all abilities and, actually, has a short learning curve as there is no complicated choreography to master. In addition, it is a completely non-impact exercise perfect for individuals with joint problems or other musculoskeletal issues that limit what they can do. 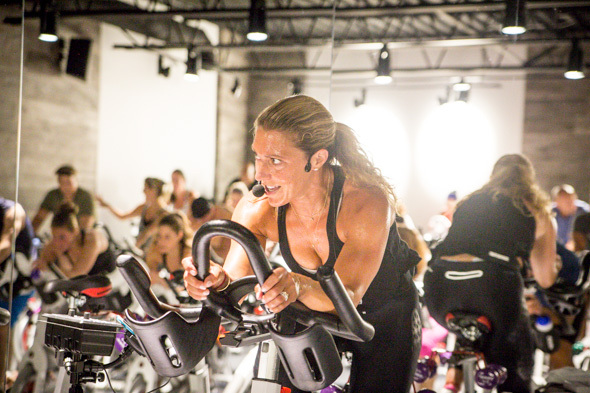 I believe that the intimidation factor is driven by the attitude you get at a lot of spinning studios, which is largely driven by the outdoor/competitive cyclists who use spinning as off-season training. 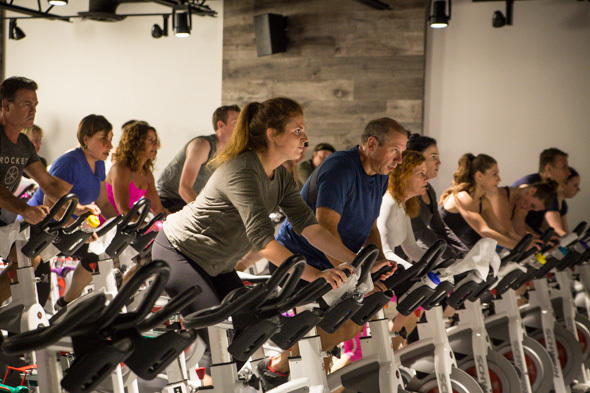 These folks tend to hold very rigid beliefs about what spinning classes should be like (i.e. should be solely designed to mimic outdoor cycling). The problem is that type of training is incredibly monotonous, and generally soundtracked by obnoxious 'club' music. 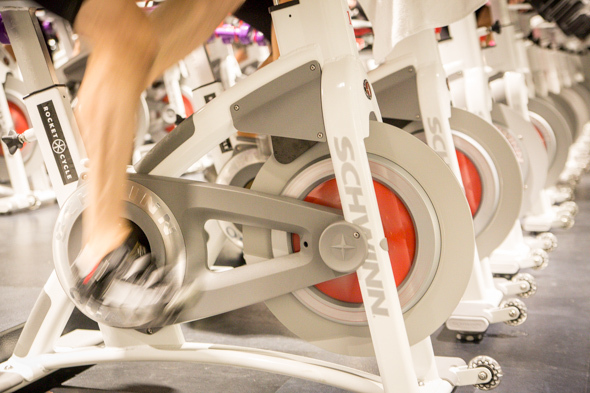 The majority of spinners are just group fitness enthusiasts looking for a good workout, and if said workout is not fun, we're not coming back. Music should be stuff that I would enjoy listening to in any other context, not just stuff with a strong beat that is reminiscent of drilling cement. The class, co-taught by Rory and instructor Amy, was definitely both fun and a good workout. The music was awesome. Although designed to be appropriate even for the most novice spinner, advanced-level riders will also get a killer workout. It's kind of retro-style spinning which I remember from when spinning first got popular in the late '90s: variety, energy, personality and good coaching. The big different between beginner and advanced classes is simply the level of instruction geared toward those stll getting used to the technique, positioning and terminology. Both Dana and Rory have been thrilled by their fast success and amazed by the friendliness of the community. Even other businesses have been welcoming and encouraging. 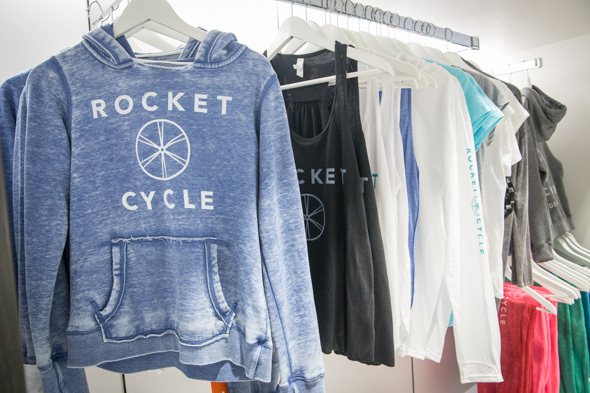 If you have ever thought of trying spinning but were too intimidated to do so, I urge you to check out Rocket Cycle. You will feel comfortable, regardless of your fitness or experience level. Classes can be purchased individually for $20 each, or in packages of five ($95), 10 ($180), 25 ($399) or 50 ($750). Special discounts are available for students.